Stay in one of our artist inspired suites. We have packages for any occassion. 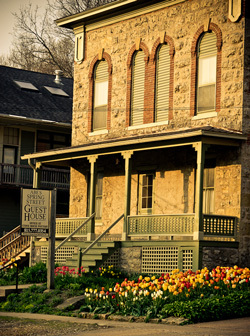 Built in 1876, Abe’s Spring Street Guest House was once an icehouse for a prominent Galena brewery, located adjacently, which now is home to Stone House Pottery & Gallery. The icehouse once stored up to 800 tons of ice harvested from the Galena River for the brewery industry. The building has 27-inch thick walls, which in its time was a great insulating factor. Today those thick walls accommodate wonderful window seats for the Bed & Breakfast. Amazing Bed & Breakfast - Christopher N.
A Guest House of Artistic Inspiration - Kat B.